Home Blog We’re giving away hundos! Doesn’t matter if you owe the IRS or got a fat refund – we all know that taxes can be a pain. To celebrate the end of tax season, we’re making it rain here at the Hoo! 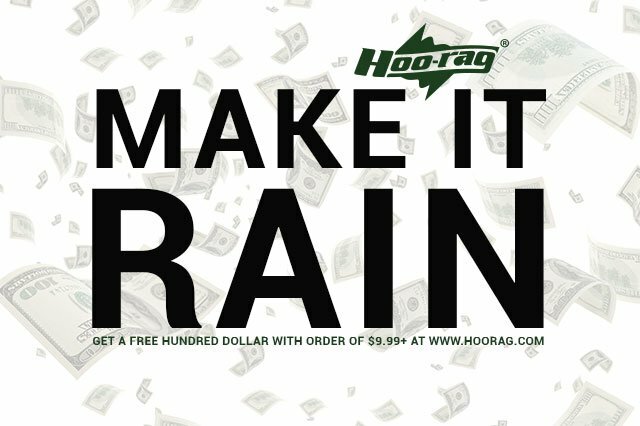 All orders of $9.99 or more placed today at www.hoorag.com will automatically include a FREE Hundred Dollar Hoo. All orders placed on 4/15/15 from 12 a.m. EST thru 11:59 p.m. EST at www.hoorag.com will automatically include a free Hundred Dollar Hoo (retail value $17.95). Valid while supplies last. No promo code needed. Do not add the Hundred Dollar Hoo to your cart unless you would like to purchase an additional. Place your order now and get your FREE Hundred Dollar Hoo! Next post: That’s All Folks! Hundred Dollar Hoo Promotion is Over.